This activity has been reviewed and is approved for a maximum of 39.00 AAPA Category 1 CME credits by the AAPA Review Panel. PAs should claim only those credits actually spent participating in the CME activity. This activity was planned in accordance with AAPA CME Standards for Live Programs and for Commercial Support of Live Programs. This Self-Assessment CME program has been reviewed and is approved for a maximum of 5.00 AAPA Category 1 Self-Assessment CME credits by the AAPA Review Panel. PAs should claim only the credit commensurate with the extent of their participation in the activity. This program was planned in accordance with AAPA CME Standards. Round Up CME at the Beach in 2018! 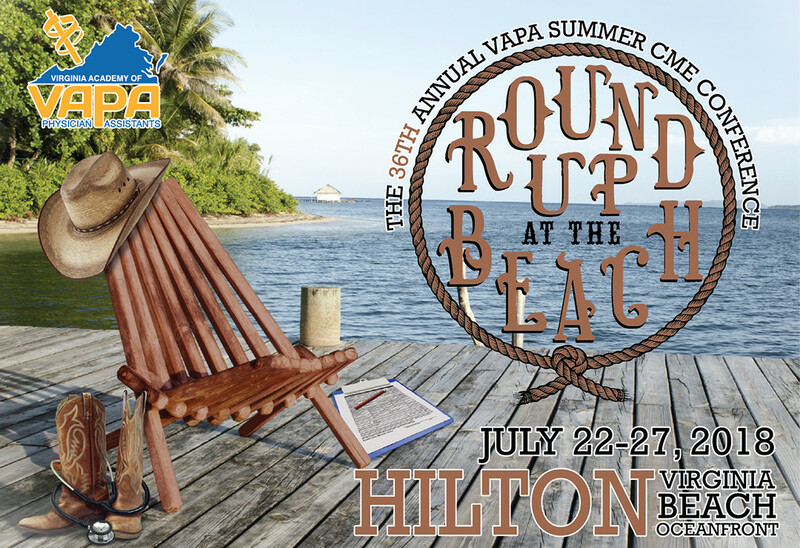 Join VAPA July 22-27, 2018 at the Hilton VA Beach Oceanfront Hotel for Sun, Fun and CME! Earn Category 1 CME credits while enjoying a family summer vacation! In support of the Virginia Academy of Physician Assistants’ mission, the focus of this year’s conference is to provide Physician Assistants, Nurse Practitioners and other providers with current medical information that will reinforce their knowledge base and introduce new concepts and clinical practice skills through a cost-effective, evidence-based, and diverse educational program. Your full registration fee includes continental breakfast each morning, refreshment breaks, lunches and access to seminars, exhibits, and events as noted on the brochure and agenda. Registration badges are required for admission to all conference events. If a spouse, guest or family member would like to join you at conference meals or audit the sessions (no credit will be given), there is a Guest Attendee registration rate available. The 36th Annual VAPA Summer CME Conference has been approved for a maximum of 39.00 AAPA Category 1 CME credits by the AAPA Review Panel. PAs should claim only those credits actually spent participating in the CME activity. This activity was planned in accordance with AAPA CME Standards for Live Programs and for Commercial Support of Live Programs. The Hilton Virginia Beach Oceanfront hotel is the annual host for our conference. Due to the time of year, size of the conference and popularity of the location, the block of VAPA rooms sells out quickly and staff cannot add or guarantee rooms. You can make your reservations today by calling 757-213-3000 or clicking the online reservations link HERE. Rooms start at $219 per night for City View rooms and range up to $334 per night for ocean view. Taxes and parking are not included. Explore All that Virginia Beach Has to Offer! Walk outside of the host hotel and you are just steps away from the boardwalk and all that Virginia Beach has to offer. Take a selfie with King Neptune, visit the Old Coast Guard Station, jump on a boat and ride beside dolphins on a Rudee Tour, cool off in the giant wave pool at Ocean Breeze Waterpark, or zip through the trees at the new Adventure Park at the Virginia Aquarium. There are hundreds of family-friendly adventures to be found as well as hundreds of amazing restaurants that are sure to please everyone. Find out more about what to do while you're at the beach, go to www.visitvirginiabeach.com and start planning now!